I live just on the edge of Pisgah National Forest at about 3000 ft. I have almost no experience gardening. We have tried a garden for the past few summers that has been unsuccessful mostly I think to lack of sunlight as our land is mostly forested and shaded. I have a new, more sun exposed location in mind and I am looking for advice on how to prepare the soil for next year. The spot I have in mind is currently a pretty impacted field of clay quality soil. What should I do now to set myself up for success in April/May 2014? I agree that shade could have been your problem. Full sun is optimal to a successful vegetable garden. Certain edibles will grow in partly shaded locations, but usually you will have a better harvest with good sun exposure. Additionally, sunshine and good air circulation help prevent many diseases. I often plant lettuces in my front garden, and the plants diminish in size and vigor as the shade increases across my yard. That said, if shade is most prevalent in your yard, I would find the very sunniest spots in your yard and plant in those spots, even if your garden is dotted around your yard. Some shade tolerant edibles include lettuce, greens, spinach, arugula, Asian greens, parsley, mint, and blueberries (more productive in full sun). And remember…mushrooms LOVE shade! Moving your garden to a sunnier space is an excellent idea and highly recommended. Look for areas with at least 6-8 hours of full sun. Locate your garden in close proximity to your home and a water source, and start small. 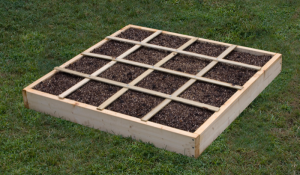 Mel Bartholomew’s Square Foot Garden method: This very popular gardening method commonly uses a 4’ x 8’raised bed with an imported soil mix. Use untreated wood to create the raised bed that is divided into one square foot planting areas. The soil recipe is 1/3 part peat moss, 1/3 part coarse vermiculite, and 1/3 part of five different kinds of compost. See http://www.melbartholomew.com/category/beginners-guide/ or get Mel Bartholomew’s book for more details. You can kick it up a notch by loosening the ground beneath the raised bed with a garden fork prior to adding your soil mix. Do not line the bottom with landscape fabric. It will become a headache. Upside of this method: Many report great success with this technique. The soil is easy to work and dries out quicker during wet spells. You can grow a lot of food in a 4’ x 8’ area. Downside:This is more expensive than an in-ground garden, and the soil will dry out quickly during dry spells since the bed is raised. Construct a raised bed garden, but instead of using Mel’s mix, use indigenous soil that has been amended with compost, etc. The soil won’t be as light as Mel’s mix but it will be less expensive. Design an in-ground garden utilizing existing soil, and amend the existing indigenous soil with compost and other goodies. Double-dig your garden area. This is an excellent and very labor intensive soil preparation method that beautifully loosens the soil and improves soil structure. You end up digging down to about two feet deep. Here are some instructions. Remember you can start small. Cover crop your future garden area over the winter. Combine oats/barley (deep roots that will loosen the soil and bring nutrients up from deep down in the soil) and Austrian winter peas (legumes produce a natural source of nitrogen and winter pea tips are delicious). Cut down your cover crop in spring and incorporate your “green manure” into the soil. Plant your cover crop now. How do you know what amendments to add to the soil? Getting a soil test is the best way to scientifically determine what to add to your soil. Otherwise you are just shooting in the dark. NC State provides free soil testing from April through November, and charges approximately $4 during the peak season for soil testing. Click here and scroll down through the Ask Ruth article for instructions on how to take a soil sample. Keep in mind that bursting-with-life soil is the very basis of organic gardening. One teaspoon of good soil contains a staggering number of microorganisms – around one billion (more than the number of people inhabiting planet Earth) Building good soil takes time and patience. Tom Elmore (of Ask Tom) suggests “two inches of peat moss on the clay, plus compost and supplements.” Personally, I don’t use much peat moss, but would mix about 50% compost in with your existing soil. WNC clay soils have many beneficial qualities, but the particle size is very small so these soils don’t breathe easily. Your additions of peat moss and/or compost will help to lighten your clay soil, give it better water holding capacity and drought tolerance, and allow more oxygen to reach the plant roots. Lime is an important addition to vegetable gardens, and is added on a regular basis. It can be used to raise the soil pH toward the ideal between pH 6 to 7. You may need to add 5-10 pounds of lime to a 100 square foot garden (refer to your soil test). 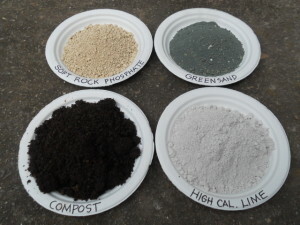 Lime not only sweetens the soil, it is an important source of calcium. Many WNC soils are high in magnesium, so it is important to maintain a good calcium/magnesium balance for optimal nutrient uptake. When these minerals are properly balanced, the soil will be looser. Lime should be added in the fall since it can take 4-6 months to kick in. In addition to helping with soil structure, compost is full of microbial activity and acts as a slow-release fertilizer containing Nitrogen (N), Phosphorus (P), and Potassium (K). Rock phosphate adds a source of phosphorus (P), and greensand and kelp provide sources of potassium (K). Loosen the ground with a garden fork. Add a generous quantity of compost and (optional) peat moss. Add other amendments like lime, rock phosphate & greensand. Either mulch your new spot to keep it weed-free until spring, plant a cover crop until next spring, or go ahead and plant a fall garden in your new spot. Start a compost pile or vermicompost (worm) bin for a source of your own high-quality compost. If you are planning to add raw manure, it should be added in the fall so it has time to decompose over the winter (caution: raw manure is a source of weed seeds). Melanie, I think you will find that your sunnier garden spot provides a better yield and more success. NC State has just started charging for soil testing during the busiest times of year. For a free soil test you must submit your sample from April through November (NC State must receive your sample by Nov. 27 in 2013). During the peak season, estimated fees for an 8 acre field would run approximately $4 to $16. Fees will not be charged during the off season. 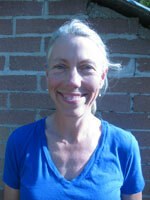 NC State encourages farmers and gardeners to submit their soil samples during the off-season.